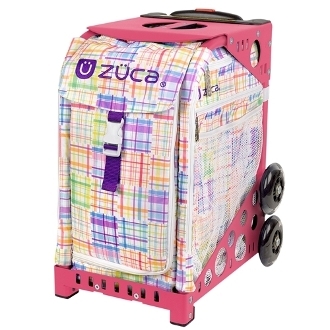 ZUCA Patchwork Insert & Frame has soft pastels in a pretty, pieced-together pattern, this friendly design feels like home--wherever you are. Insert Includes matching Name Tag, while supplies last. These bags are great for kids in competitive sports like cheer, skating, gymnastics or dance. You can use them to haul all your gear and you can sit on them when seating is limited at competitions. Can also be used as weekender bags when you purchase the Pro Packing Pouches.